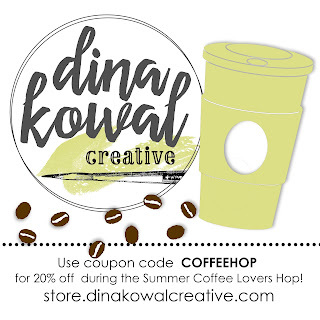 Dina Kowal Creative: Summer Coffee Lovers Blog Hop! 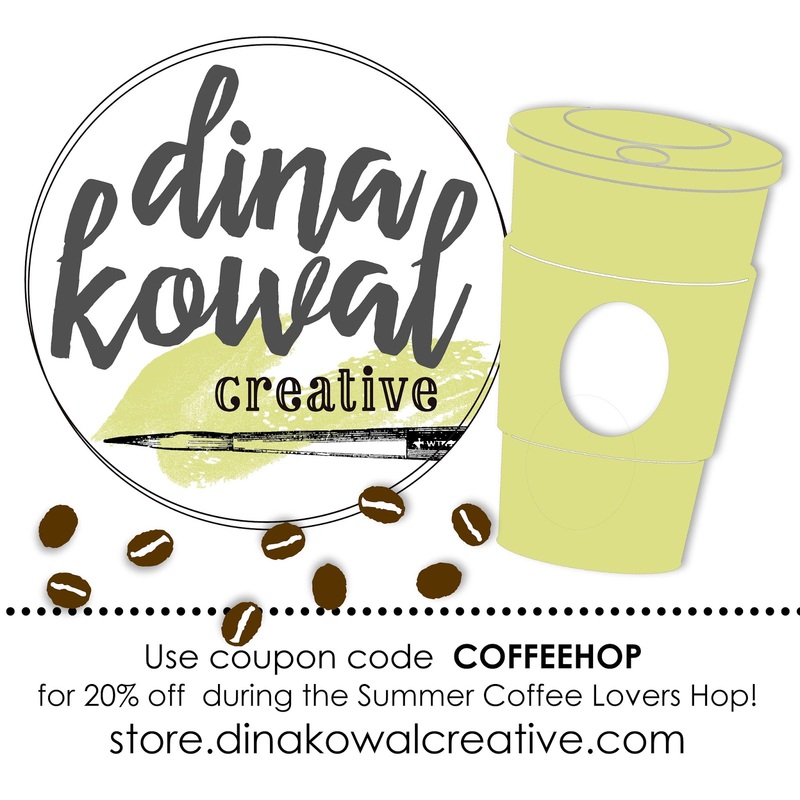 It's time for the Coffee Lovers Blog Hop, and I'm so excited to be a Super Sponsor again! Keep reading to find out how you can win these 3 art prints, and receive a special coupon code for my online store! You can find these and more in my store HERE! I made a card for today's hop without any real plan... 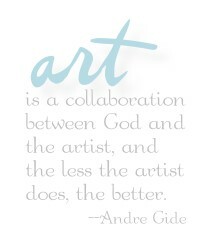 I think this one was meant for me, because I've been a little overwhelmed this week - our oven went out, my in-laws are on the way here, my oldest hasn't been feeling well, and I've had an additional work load with a painting in progress and card samples due for the Mixed Media show next month. All that to say... it felt good to pour some art out and process a little. Acckkk! This teapot stamp is from my own line of stamps at Impression Obsession - you can see all my designs HERE, and if you hurry you can take advantage of their 25% discount code - it's only good through Sunday (6/25)! You'll find all the details on their home page. I started with a white matboard square, stamping the background image in a light shade. I stamped the silhouette image then added some highlights and shading with pencils - the highlights were done with a white Coloursoft pencil, and the deep shadows and counter surface were done using Inktense pencils. My base panel is from a file of gel prints and other papers I've used to clean my brayer - it's got some fun copper tones in it that play well with the blue of the tea pot. For a chance to win prizes in our hop this week, you have to play along! Head over to the Coffee Loving Cardmakers blog for all the details, and to link up your spring coffee, tea, or cocoa themed project! One lucky winner will receive one of my handmade coffee art pendants for participating this week - You can find these and more coffee (and other!) 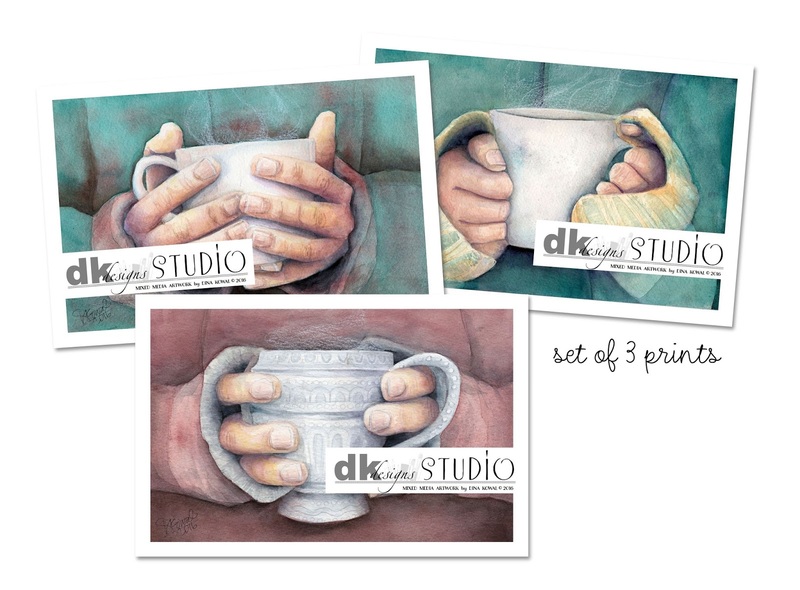 themed gifts in my online store - and to thank you for hopping and visiting today, you can use coupon code COFFEEHOP for 20% off your entire order! Dina, Your coloring and shading with your pencils of your beautiful teapot is Stunning my friend. Love your background layer with all your left over brayer inks. So happy you were able to play and share your beautiful card. I do not know how you manage with only 24 hours in the day. Take care and TFS. Hugs. Oh my. This is a masterpiece! The cards are lovely, but the jewelery is amazing! Thanks for sponsoring the hop. Dina, you work is always so lovely. Your card is simply a-mazing. Your card is so gorgeous and the necklace is beautiful too. Thanks for being a super sponsor. Beautiful work! I just love the pendents! stunning work! what a lovely extra prize! Thanks for being a hop super sponsor. Wonderful card and thanks for being a super sponsor. I just LOVE that pretty blue teapot card! It has such great color and shading to it--amazing! Thanks for being a super sponsor too! You create well under pressure I see, love your design! keeping my fingers crossed. Thanks so much for being a sponsor at the CLBH! Dina, this card is outstanding. The techniques and layout design are so well executed. Thanks for this inspiring card, store discounts and, best of all, being a super sponsor for this blog hop. Dina, I love the color combination of the background pieces. The classic black and white mixed with the brick color is absolutely stunning. Right up my alley!! Wow...your coloring is just amazing! Beautiful jewlery too. Thanks for being a sponsor! It really is a dream your card, I was fascinated by the colors and the background. Great job.Thank you for being a great sponsor. So beautiful and artsy!! Thanks for sharing and being a Super Sponsor for the hop. WOWZERS. Your coloring is beyond fabulous. So beautiful. Thanks for being a Super Sponsor for the hop. Love your card and your art pieces! Beautiful card, beautiful art and beautiful pendants... thank you so much for being a sponsor! Beautiful works of art! So pretty and unique thanks for sharing and for being a sponsor. Wow love the depth you created with your card, gorgeous colors too! Beautiful art works! Really cute card! Love the design and the pendants are adorable. Beautiful card. Very rich. Love the design. I love the shading on the teapot and the detail in the background of this gorgeous card! Thanks for sponsoring the hop and for the discount! Absolutely gorgeous - you are so talented. Thanks for sponsoring. Oh my gosh, you do amazing work!!! Am so in awe! Love your pendants too!! Thanks for being a Sponsor! Gorgeous card, I love the pendents!! Lovely prints and pendants, Dina! Thanks for sponsoring the CLBH. 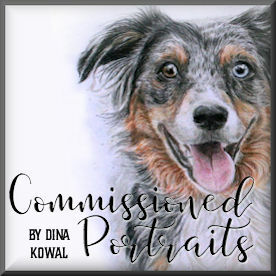 This is Fantastic, Dina! Your coloring is excellent ! I love the different prints and painting you have been sharing lately. Thanks for being a sponsor and hope your week settles down. Stunning detail on your card! It's gorgeous. I love the necklaces. Those are amazing! Thanks for being a sponsor. Totally impressed! Your coloring is absolutely amazing! Wow! I aspire to be like that someday! Thanks for the inspiration and for the opportunity to win! Your teapot is so beautiful and how creative you are with those adorable necklaces! Your work is always so beautiful and colorful.